Maybe it’s because my name is Charlotte and I grew up on a farm, but I have always had an affinity for spiders. I realize not everyone shares this attraction, but here is some news that may help you tolerate them. Spiders are the most important and abundant predator of insect pests in most yards. This means spiders are not hanging around just to frighten you. In fact, they are actively defending your yard and garden against a multitude of insect pests. Spiders eat many types of nuisance and plant damaging insects, including mosquitoes, stink bugs, caterpillars, aphids, and beetles. Actually they will eat just about any insect they can get their fangs on, including other beneficials, though on the whole they eat a lot more bad bugs than good ones. In turn, spiders are an important food source for many species of birds, serving as both predator and prey in the food web. Spiders are common in gardens and landscapes throughout the year, though their numbers are generally highest in late summer and fall. An over abundance of spiders in your yard or home is an indication that there are plenty of insects around for them to eat. If you have a lot of spiders around and you can tolerate them, the best thing you can do is leave them alone so they can naturally reduce the insect population. While all spiders have the ability to spin silk, not all of them form webs. Some of them hunt. 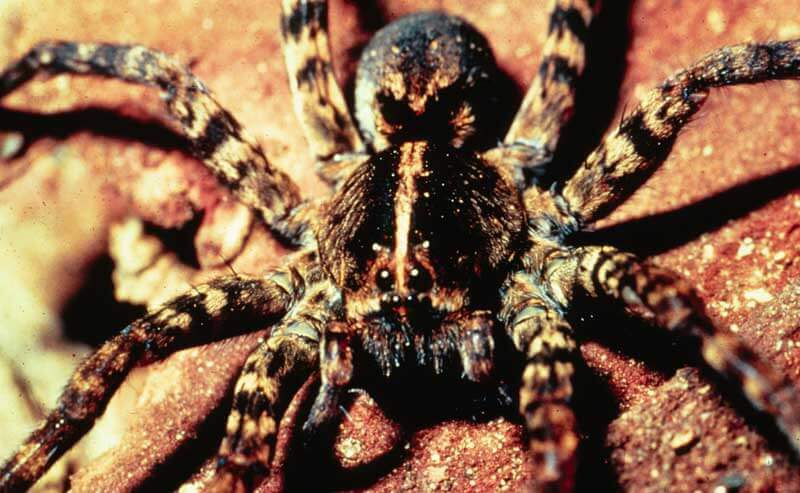 The Carolina wolf spider, a large brown roaming spider, is a common hunter in our area, and can be found actively seeking prey both indoors and out. Also common are the much smaller jumping spiders, which as their name indicates, leap onto their prey and can move at amazing speeds. 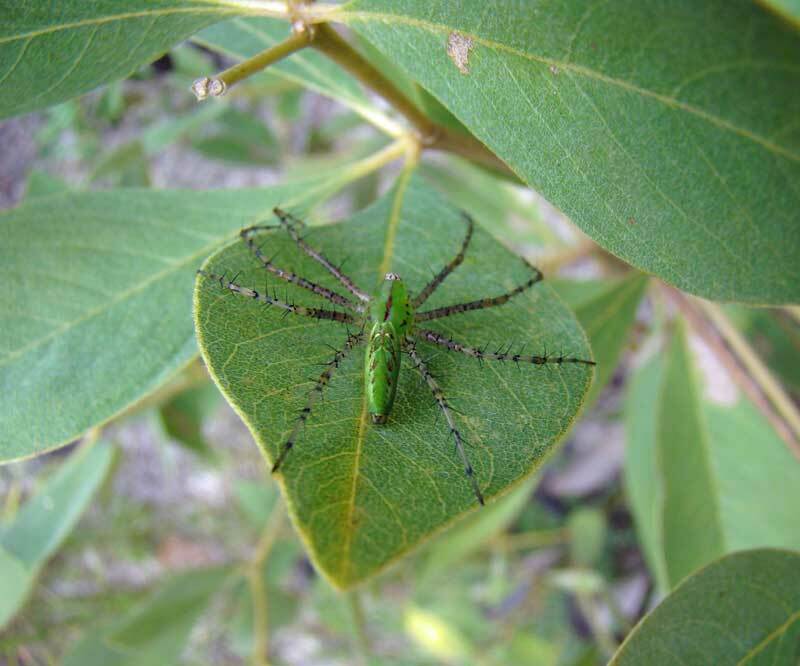 Another common hunting spider found in our region is the beautiful green lynx, my favorite species of spider. They are often found hunting among flowers and low shrubs. Web weaving spiders catch many types of flying insects in their sticky webs. The most well known of these industrious garden defenders are the orb weavers, whose large, symmetrical webs can truly be considered works of art. This group includes the large black and yellow garden spiders, also known as writing spiders, as well as the spotted orbweaver, who, like many orbweavers, takes down its web each morning by eating it and builds a new web every night! Incidentally, Charlotte, from Charlotte’s Web, was a barn orb weaver, a species of spider native to the northeastern US and not found in our area. Most spiders will bite if handled or when defending their egg sac. Most of the time these bites only result in a small welt that is much less painful than a bee or wasp sting and there is little to be concerned about. There are two spiders found in our area though that can be more serious – the black widow and the brown recluse. Black widows are one of the two potentially dangerous spiders found in North Carolina. Of the two, black widows are much more common and easily recognized, typically having a large bulbous shiny black body with a red hourglass mark on their back. They are often found in dark and damp places like wood piles, under decks, or hanging out around concrete blocks. While black widow venom may cause nausea, sweating, and tremors, their bites are rarely serious to healthy adults. Brown recluse spiders are much smaller, about the size of a quarter. Their bodies are light brown and they can be difficult to differentiate from several other common spiders. Brown recluse spiders are considered rare in our area, preferring to stay in attics, under houses, or other places that are rarely disturbed. Their bites can result in open sores that are slow to heal. Learn more about the brown recluse spider here. Since most spider bites occur on the hands, you can protect yourself when working in areas where either of these spiders may be by simply wearing gloves. · Common spiders in landscapes. · Spiders in and around homes. · North Carolina spiders – photos and descriptions. Charlotte Glen is the Agriculture Agent – Horticulture at the NC Cooperative Extension, Chatham County Center in Pittsboro.